If you look closely at a morel mushroom, and pay attention to just a few characteristics, there is absolutely no mistaking a false (poisonous) morel for a real morel. First, take a good look at the following picture. These are REAL morels. Notice that the caps of real morel mushrooms are deeply PITTED. 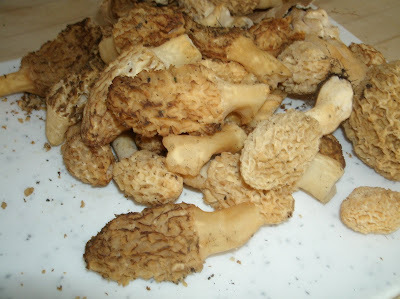 Most false morels, on the other hand will be more crinkly (like brains) than pitted. Now contrast the above photographs with a false morel below. Note that the cap is more crinkly than it is pitted (like a crumpled up piece of paper, or a small brain); and notice that difference in how the cap is attached to the stem. 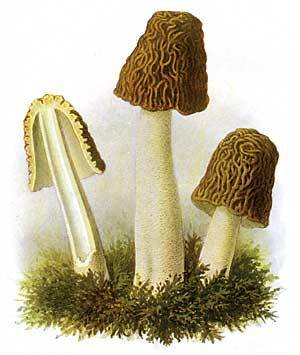 In a false morel, the cap overhangs the stem, but in a real morel, the cap and the stem are all one piece.